May God’s peace be upon you in Jesus Christ, who is the Prince of Peace. 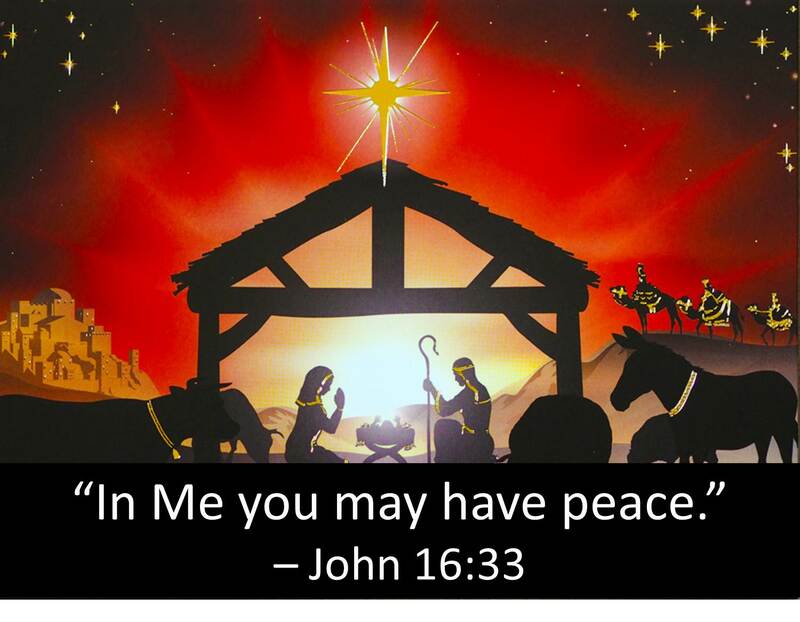 See Charles Stanley – “Jesus – the Prince of Peace” – at https://www.intouch.org/Content/27938/LP111218.pdf. 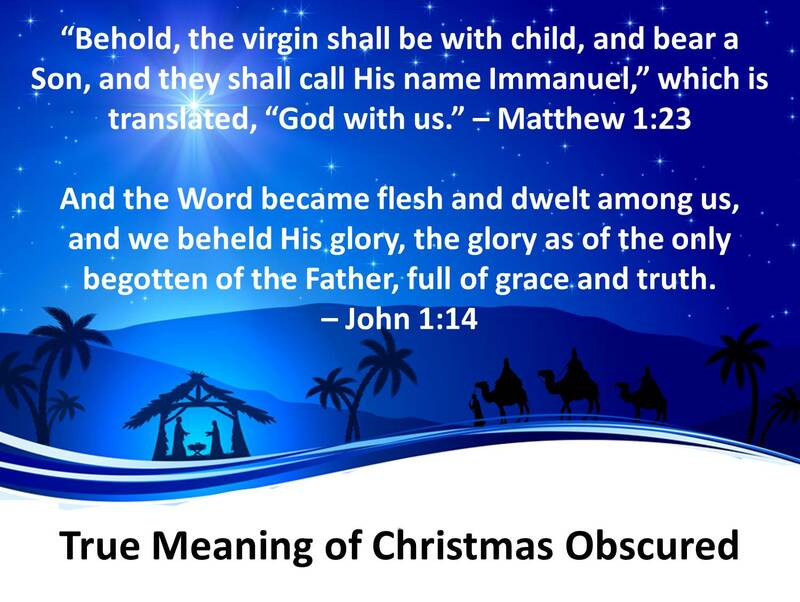 See also “True Meaning of Christmas” at http://wp.me/p4scHf-6w. This entry was posted in Uncategorized and tagged Charles Stanley, Christmas, In Touch Ministries, Jesus, peace, Prince of Peace on December 25, 2014 by BrotherWatch. Orwell’s Big Brother would be proud! Anarchy has been termed democracy in action. Rioting, looting, and arson have been termed components of free speech. And murder has now been called justice. Yesterday, two innocent New York City police officers were assassinated by a racist thug who is himself a victim of propaganda. The officer were not “executed” – execution implies they were tried and convicted of a crime. On Fox & Friends this morning, former NYC mayor Rudy Giuliani said it is “shameful” that politicians are using propaganda to separate the community from the police. Remember, the meme of “hands up, don’t shoot” is a racial myth! It never happened. yet it has been used to justify all manner of injustice and to foment racial division. The racist cop myth is being used to disguise the real causes of legitimate grievances within the black community: fifty years of failed liberal policies. 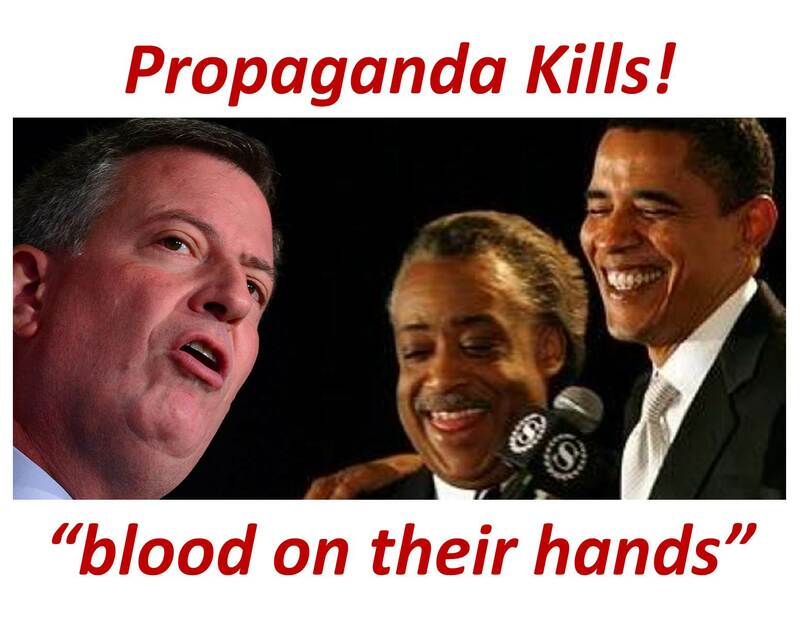 NYC Mayor de Blasio’s policies have allowed protests to turn into anarchy as “protestors” call for the death of cops. The “protestors” got their wish. Fox News contributor Peter Johnson actually equated police officers turning their backs on de Blasio with the step-father of Michael Brown calling for Ferguson to be burned to the ground. Johnson said that both were “emotional responses” to their respective situations. Wrong answer. One was a peaceful show of disagreement with the mayor, the other an out-of-control call for mob violence. “Dead cops!” Apparently only “black lives matter.” Cops of any color do not. And those who contend that all lives matter are condemned, shouted down, attacked, and killed. Nevertheless, with anarchists in the streets and violence overtaking America, President Obama contends that we are in the midst of a “healthy conversation” about race. This entry was posted in Uncategorized and tagged assassination, Big Brother, black lives matter, de Blasio, dead cops, execution, Ferguson, Giuliani, hands up, kill cops, murder, Obama, Orwell, propaganda, racist cops, Sharpton, white racism on December 21, 2014 by BrotherWatch. The politically-motivated Democratic Senate swan song attack against the CIA and the Bush administration – euphemistically called “the Torture Report” – is deeply flawed and false in many of its particulars. Meanwhile, President Obama gets a pass on killing hundreds of innocent civilians through drone strikes. Meanwhile, only three terrorists were waterboarded. 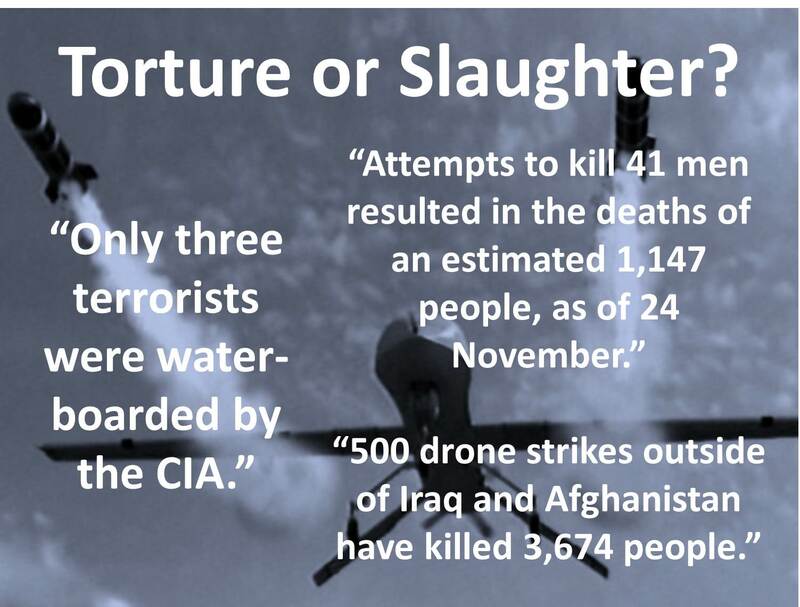 Which is more moral, more humane, more just: waterboarding terrorists or murdering innocents? This entry was posted in Uncategorized and tagged CIA, civilian deaths, collateral damage, drones, Obama, propaganda, torture, waterboarding on December 13, 2014 by BrotherWatch. Is Barack Hussein Obama “the first Jewish president” as some contend? 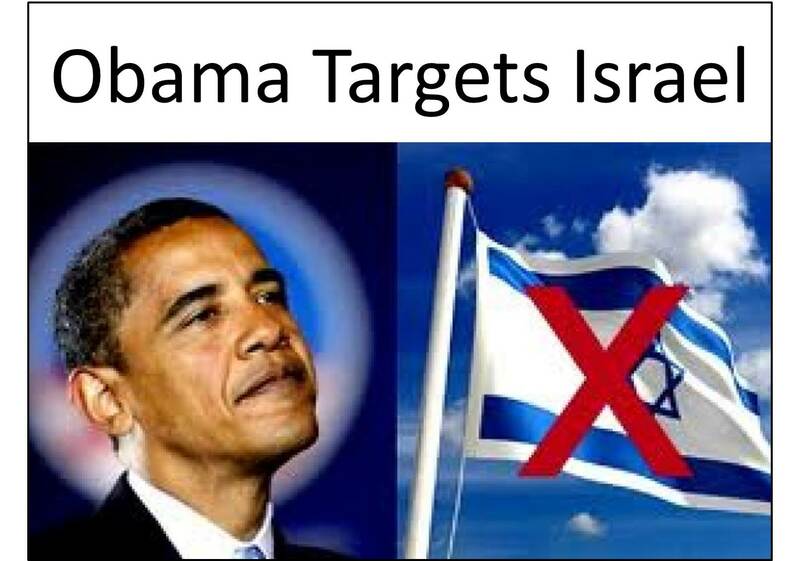 If President Obama is so pro-Israel then why is he so anti-Israel? For Obama, America is the problem. For Obama, Israel is the problem. Now Obama is considering sanctions on Israel. But there’s far more to it than that. There are distinct ideological and (dare I say it) theological differences between these two heads of state. Is Obama really pro-Israel? The first Jewish president? Hardly. Obama has Muslim roots and Muslim sympathies. Throughout his political career, Obama has defended and extoled Islam at every turn, while expressing either disdain or hostility toward Christianity and Judaism. Obama finds a strange moral equivalency between Israelis conducting defensive strikes and Palestinians engaging in terrorism. Strikingly, Obama always sides with the Palestinians and actually blames Israelis for the deaths of civilians used as human shields by Palestinians. Throughout his presidency, Obama has insisted on a Middle East peace process but taken the side of the Palestinians, insisting that Israel stop its settlement program – as a precondition to those very peace talks. Obama also favors a suicidal return to pre-1967 borders. Despite the fact that the Palestinians have consistently broken its cease-fire agreements with Israel, Obama blames Israel. Obama opposes Israel in large measure because of his Muslim roots and because Israel is an American ally who shares American values. Americans have supported Israel since its birth in 1948. Obama – hailed the first Jewish president – has broken with that long tradition and is risking both the demise of Israel and civilization as we know it. “Obama’s America – Fundamentally Flawed” at http://wp.me/p4scHf-1h. “Obama’s Muslim Roots and Sympathies” at http://t.co/3FIt1xmLqV. Complete timeline of Obama’s anti-Israel hatred at http://www.breitbart.com/national-security/2015/03/20/a-complete-timeline-of-obamas-anti-israel-hatred/. Steve Hayes, Special Report, FNC, 12/5/14. This entry was posted in Uncategorized and tagged anti-Israel, anti-Semitic, fraud, Islamic, Netanyahu, Obama, Orwell, Orwellian, pro-Muslim, propaganda on December 9, 2014 by BrotherWatch. Empathize? With terrorists and tyrants? Having run the State Department for so many years, one would think that the smartest woman in the world – who oversaw the dismantling of peace around the world – would know what the perspectives and points of view our enemies possess. ISIS and other Islamic terrorists want to create a worldwide caliphate and, to do so, they must convert or kill every other person on the planet, especially us. That is their perspective and point of view. Does Clinton, like Kerry, think we can talk ISIS into peace? How do we show these butchers, beheaders, and barbarians “respect?” Through negotiation? With appeasement? How are we to empathize with butchers and barbarians? Will that empathy dissuade them from further butchery? Genghis Khan was undeterred by pleas for mercy. Vladimir Putin wants to restore the old Russian Empire. He seized the Crimea despite world protests and he is hell bent on absorbing the whole of the Ukraine. Virtually unopposed by Obama and his diplomacy. How did that reset button work out for you, Hillary? Iran is unalterably resolute in its desire to develop nuclear weapons and the Obama administration’s policy of appeasement will never contain that threat. Indeed, for all these years, negotiation has always worked to Iran’s advantage. Instead of acknowledging evil where it exists and taking action to protect Americans, Obama talks, talks, talks. And Hillary Rodham Clinton – the presumptive POTUS in 2016 – apparently supports that policy. 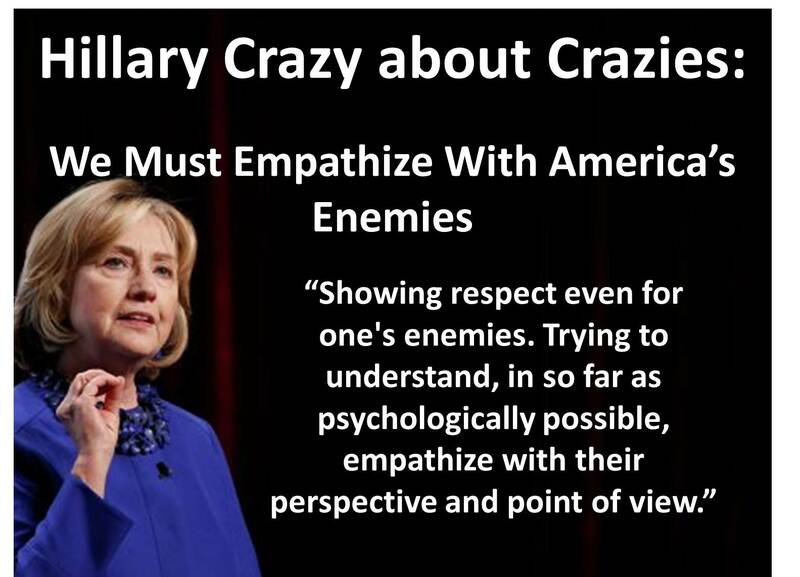 Daniel Harper, “Hillary: We Must Empathize With America’s Enemies,” Weekly Standard, 12/4/14, http://nation.foxnews.com/2014/12/04/hillary-we-must-empathize-americas-enemies#. This entry was posted in Uncategorized and tagged Clinton, diplomacy, Hillary, Hillary Clinton, Iran, Iraq, ISIS, Kerry, peace, Putin, Russia, terrorists, Ukraine on December 5, 2014 by BrotherWatch.